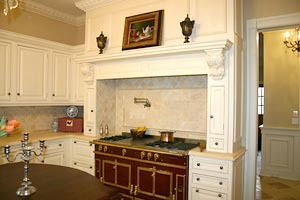 “The cabinetry in this kitchen is Clive Christian Furniture with an antique cream hand-painted finish. The family owns multiple restaurants and is used to professional kitchens, equipped with the best appliances and sufficient working space, and wanted that in their own home as well. 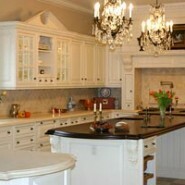 But they also wanted to stay away from having it look as sterile as a restaurant kitchen.